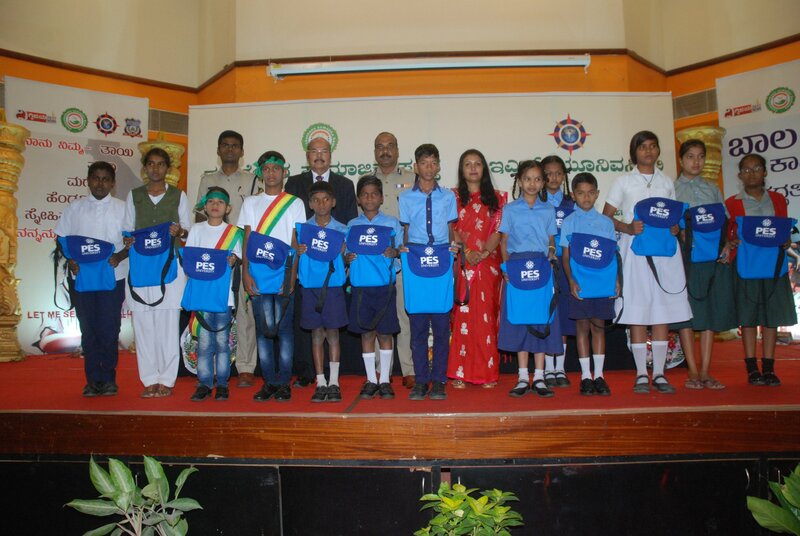 As part of social initiatives, PES University distributed free schoolbags and notebooks to students of higher primary level in government schools. The programme held on the campus was inaugurated by T. Suneel Kumar, IPS, Commissioner of Police, Bengaluru city. PES has been undertaking such donation drives for over a decade. The commissioner highlighted the need to inculcate human values and urged the school kids to avoid bad company and behave well to grow up as good citizens. Dr. M.R. Doreswamy, Chancellor in his presidential speech, said that PES has been supporting the holistic development of government school students through adopting the schools, providing free notebooks and schoolbags and undertaking direct teaching. He emphasized that a university has a duty towards the neighbourhood and the responsibility to support needy students. Dr. Doreswamy added that ‘Education without teaching humanitarian values is not an education at all’. Dr. K.N. B. Murthy, Vice Chancellor, PES University, Shri K. Annamalai, IPS, Deputy Commissioner of Police and Shrimati Rashmi S, President, Punashchetana Samajika Samsthe graced the occasion. 660 students from seven Government schools received the notebooks, pens and schoolbags. Following distribution, students, trained by the Punashchetana Samajika Samsthe, entertained the audience with a dance and drama performance as part of Parivarthane- the awareness program on crime. The programme was held on Dec 1, 2018.